The best way to aggressively enhance the mug of your EVO 10. 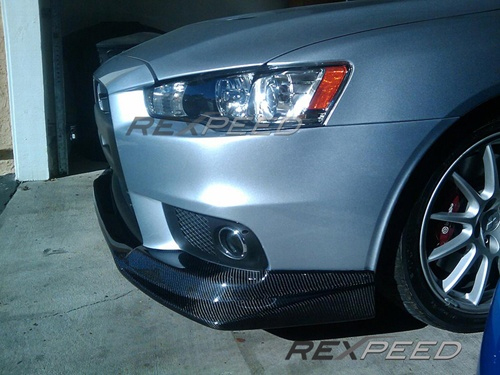 Each lip is made from high quality carbon fiber with clear coat finish. Fitment is exactly what you see in the pics. Each individual carbon lip has been test fitted so our customers do not have to worry about fitment issues. Comes with all necessary hardware for a complete install. Available in 2x2 weave only. TECH TIP: Direct bolt on! No other modifications needed. Easy installation takes 1.5 Hours and can be done with common hand tools. Shipping Note: Currently this item can only ship to the USA, Asia and South East Asia. Due to the large size of this item it ships directly from Rexpeed in Taiwan. Buyer is responsible for all duty and customs fees on this item. No Express shipping is available on this item.